So what kind of animal is the blues harp player? 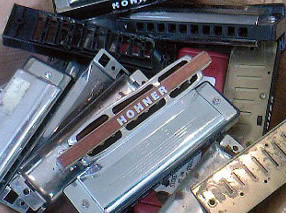 In the first chapter of the Apprenticeship Series, guest blogger Elwood takes us through part 1 of his blues ethnography, Figuring Out The Harp Player. For some, the journey to becoming a master takes them from the depths of frustration to the giddy heights of triumph via a thousand smoky jam sessions and hundreds of hours in the woodshed. Many of us, however, find the journey to becoming a master shorter and much easier: it goes all the way to the local music store and back – more often than not via the ugly hat shop.